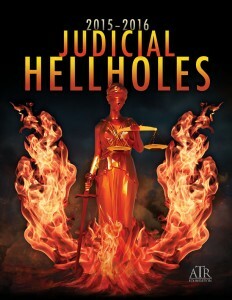 The 2015-2016 Judicial Hellholes report shines its brightest spotlight on nine courts or jurisdictions that have developed reputations as Judicial Hellholes. #1 CALIFORNIA. California is the epicenter for lawyers trolling to bring disability access lawsuits against small businesses and ridiculous class action lawsuits against food and beverage companies. Certain areas of the state are also a hotbed for asbestos litigation. Local district attorneys and government agencies have taken it upon themselves to partner with private contingency fee lawyers, leading them to bring novel claims against businesses that make paint and prescription drugs. One such case, which resulted in a $1.15 billion judgment pinning responsibility for remediating lead paint across the state on three companies, remains on appeal. Another case, seeking to blame drugmakers for painkiller abuse, was recently dismissed by an Orange County trial judge who recognized that addressing such problems should fall to experts and policymakers at the FDA, not local courts. #2 NEW YORK CITY ASBESTOS LITIGATION. For years this report has raised concerns about recently convicted former New York State Assembly Speaker Sheldon Silver’s moonlighting at a plaintiffs’ asbestos law firm. Now, with Silver perhaps headed to prison and the pro-plaintiff judge who headed New York City’s asbestos court replaced, the Big Apple may begin to bob up from the bottom of the barrel. The new judge recently declined to put the city’s asbestos litigation on hold while the parties develop a more balanced process for handling the lawsuits, calling the system “not so rampantly unfair.” Just mostly unfair — given consolidation of trials, reintroduction of punitive damages, imposition of liability on one product manufacturer for the asbestos-containing parts attached by another, application of unwarranted joint liability, and the flipping of the burden of proof onto defendants. #3 FLORIDA. Those who do business, practice medicine or are otherwise unfortunate enough to be hit with a lawsuit in Florida are, by now, sadly familiar with the cycle. The Florida Supreme Court issues a liability-expanding ruling that is out of sync with courts in the rest of the country. Even when the state legislature, which is heavily influenced by trial lawyers, manages to enact reforms, the state’s high court nullifies them in favor of boundless liability in the Sunshine State. In 2015 the court kept a vague, plaintiff-friendly standard for assessing whether a product is defective, permitted inflated awards for future medical expenses, and placed liability on landlords for the acts of criminals. The Florida Bar’s recent vote to recommend that the high court reject the legislature’s adoption of federal and most state courts’ higher standard for evaluating the reliability of expert testimony shows to what discouraging extent plaintiffs’ lawyers dominate bar proceedings. #4 MISSOURI. The “Show Me Your Lawsuits State” has a reputation for a judicial nominating process hijacked by the plaintiffs’ bar, a state high court that issues outlier decisions and strikes down civil justice reforms, and a lax standard for admission of expert testimony that allows “junk science” into courts. The City of St. Louis is an area of particular concern. It is viewed by plaintiffs’ lawyers as a favorable venue for asbestos litigation with the potential for excessive damage awards. #5 MADISON COUNTY, ILLINOIS. Asbestos litigation is an industry in Madison County, which handles about a third of all such lawsuits in the nation. Most of these cases have no connection to Illinois, much less Madison County. Hundreds of cases are set for trial in a single day, a tactic used to pressure defendants into settlements. Local plaintiffs’ law firms have significant sway with the county’s judiciary, getting their colleagues appointed to the bench. And the county’s past as a perennial Judicial Hellhole is the present and future as plaintiffs’ lawyers continue their attempt to resurrect a $10.1 billion judgment stemming from a class action against the tobacco industry that the state’s high court threw out a decade ago. #6 LOUISIANA. Louisiana has long been known for its colorful plaintiffs’ lawyers. Come January 2016, it will be led by one. The election of John Bel Edwards – a trial lawyer who as a state lawmaker for eight years consistently opposed every civil justice reform proposal and whose campaign was funded by the plaintiffs’ bar – poses significant challenges to future fairness in state courts. As is, Louisiana’s high threshold for obtaining a trial by jury makes its locally elected judges very powerful, and the state’s lax venue law lets plaintiffs’ lawyers choose their favorite courts and judges. Furthermore, plaintiffs lawyers, sometimes working with local governments, have a history of attempting to siphon money from the state’s major employer, the oil and gas industry. The good news is that voters sent incumbent Attorney General James “Buddy” Caldwell packing after hearing too often of his too cozy relationships with trial lawyers. #7 HIDALGO COUNTY, TEXAS. Seeking to profit from historic hail storms that caused millions of dollars in damage in 2012 and 2013, plaintiffs’ lawyers have filed more than 10,000 lawsuits targeting insurers in this rural Texas county. Local judges are known for handling cases in a manner that puts defendants at a disadvantage. Plaintiffs’ lawyers have made hundreds of millions of dollars in fees from property damage lawsuits in recent years while policyholders have struggled with the resulting doubling of insurance premiums. #8 NEWPORT NEWS, VIRGINIA. Plaintiffs’ lawyers bringing asbestos claims in the Circuit Court for the City of Newport News have the highest win rate in the country. They are aided by a uniquely low causation standard. Juries are instructed to impose liability as long as the resulting exposure to a defendant’s product was not “imaginary.” Plaintiffs’ lawyers manipulate the system by waiting to get a court judgment against a solvent defendant before making administrative claims against trust funds established by bankrupt companies, a practice known as double-dipping. It’s no wonder that Newport News has become a magnet for asbestos litigation, hosting 7 of every 10 cases filed in Virginia. #9 U.S. DISTRICT COURT FOR THE EASTERN DISTRICT OF TEXAS. This jurisdiction, the only federal court included in the Judicial Hellholes report, is the nation’s leading forum for patent litigation. Most of the lawsuits are filed by patent trolls – entities that do not innovate, but exist only to sue. This year concerns expanded beyond patent cases when the court imposed a record $663 million judgment against a maker of highway guardrails. A judge imposed triple damages, additional civil fines, and attorneys’ fees against the company that stood accused of nominally modifying the design of the rails purchased by the government, even as a federal agency’s repeated testing finds the product compliant with safety standards. Beyond the Judicial Hellholes, this report calls attention to four additional jurisdictions that bear watching due to their histories of abusive litigation or troubling developments. Watch List jurisdictions fall on the cusp – they may drop into the Hellholes abyss or rise to the promise of Equal Justice Under Law. WEST VIRGINIA. In an encouraging move that may yet stall, perennial Judicial Hellhole West Virginia has dramatically managed to drop to the Watch List. The change results from the legislature’s enactment of several significant civil justice reforms in 2015, following the voters’ Election Day 2014 choice to demote the legislature’s trial lawyer-led majority to the minority. Voters’ earlier choice to replace former Attorney General Darrell McGraw, Jr. with reform-minded Patrick Morrissey also helped move the dial. But the West Virginia Supreme Court of Appeals, the state’s sole appellate court, continues to issue liability-expanding rulings, some of which the legislature laudably overturned this year. The high court’s latest travesty allows individuals who illegally obtain, use and sell painkillers to sue doctors and pharmacies that allegedly filled their prescriptions. PHILADELPHIA, PENNSYLVANIA. The Philadelphia Court of Common Pleas hosts one of the largest mass tort dockets in the nation. The court effectively withdrew its invitation to lawsuits from around the country with the adoption of procedural reforms in 2012, but the jurisdiction is again experiencing a rise in out-of-state pharmaceutical claims. Changes on the high court that could favor plaintiffs, the state’s embattled activist attorney general’s alliance with private plaintiffs’ lawyers, and a doubling of disability access lawsuits are additional reasons for concern in the Keystone State. NEW JERSEY. New Jersey’s substantial mass tort docket, primarily targeting the state’s pharmaceutical industry, changed in 2014 when a judge known for favoring plaintiffs was promoted to the appellate division. Atlantic County’s new judge has shown signs of fairness. Concern remains, however, given the state high court’s disfavoring of arbitration, a plaintiff-friendly consumer protection law, and the excessive liability faced by doctors and healthcare providers. Observers are closely watching how appellate courts rule on a case that could unfairly require defendants who choose to go to trial to pay an entire damages award – even the portion of settling parties. POTTAWATOMIE COUNTY, OKLAHOMA. A newcomer to the Judicial Hellholes report, this small county has developed an outsized reputation for plaintiff-friendly rulings. Plaintiffs’ lawyers have chosen this county as a place to file mass tort claims against medical device makers. And a local judge rewarded plaintiffs’ attorneys with $7.2 million in fees for bringing a class action that recovered less than $50,000 for drivers whose decorative front-end spoilers were easily damaged by curbs. The Oklahoma Supreme Court wisely threw out that fee award this year with a concurring justice observing that the lawsuit was never about protecting consumers and all about “attorneys acting with a business plan.” But a local judge this year gutted the workers’ compensation system by recognizing an exception so broad that it will allow many lawsuits against employers outside the no-fault program. Dishonorable Mentions, which annually highlight singularly unsound court decisions, go this year to the Supreme Courts of Colorado, Indiana, Nevada, New Hampshire and South Carolina; an appellate court in Maryland, and a trial court in Tennessee. This report also enthusiastically emphasizes good news from some of the Judicial Hellholes and other jurisdictions across the country. Points of Light are examples of, among other things, fair and balanced judicial decisions that adhere to the rule of law and respect the policy-making authority of the legislative and executive branches. This year’s highlights include helpful media investigations in Louisiana; positive court decisions in Delaware, Nevada, Ohio, Texas, Kentucky, Florida and Texas; and positive civil justice reform enactments in 15 states. West Virginia undertook the most significant statutory reform in 2015, facilitating its drop from this report’s ranking of Judicial Hellholes to the less onerous Watch List. Other notable reforms include greater transparency between the tort and trust fund systems for asbestos claims in Arizona, Texas and the aforementioned West Virginia; good-government safeguards when the state hires outside lawyers in Arkansas, Nevada, Ohio and Utah; and protections against expansions of property owner liability to trespassers in Nevada, South Carolina and Wyoming. Two special sections of the report examine federal multidistrict litigation (MDL) and the influence of the American Law Institute (ALI). MDLs can be an efficient mechanism for managing mass torts, but critics say plaintiffs’ lawyers’ misleading advertising has inflated dockets and increased pressure on judges to push settlements, even in meritless cases. Observers are closely watching the ALI, too, with its ongoing projects addressing consumer contracts, data privacy, and liability insurance, all of which have the potential to alter the direction of state law, for better or worse.